Born wild in Thailand in 1963, Dulary was captured and imported to America. She was on exhibit at the Philadelphia Zoo by the following year. During her time at the zoo, she lived with both Asian and African elephants. In July 2005, she suffered an injury near her right eye during a shoving match instigated by an African elephant she had previously gotten along with. Dulary recovered completely from the injury. After the injury, she was housed next to, but not with the Africans due to concerns that there could be additional negative interactions and potential for injury. In 2006, after determining there was insufficient funding to build a new elephant habitat suitable for housing an expanded herd, the Philadelphia Zoo relocated its elephants and Dulary was sent to The Elephant Sanctuary. 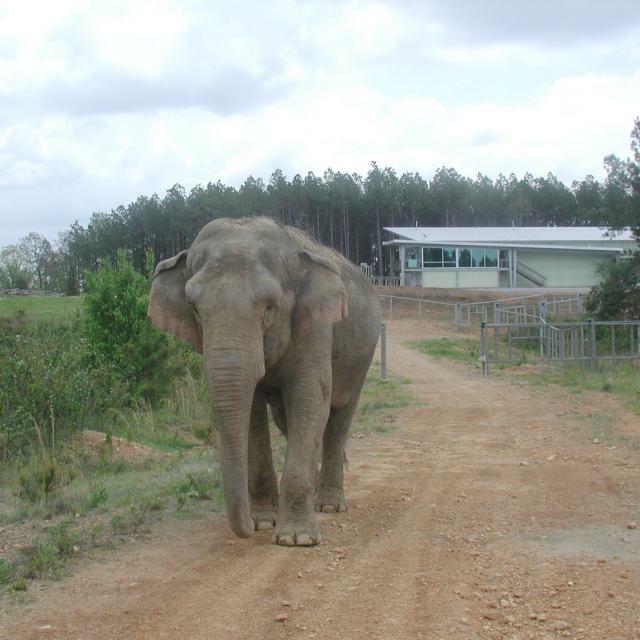 Dulary arrived at The Sanctuary on May 1, 2007, as the 23rd resident. Despite the gentle, steadfast efforts of Caregivers who spent nearly four hours encouraging Dulary to come off the transport trailer, it was Tarra, The Sanctuary’s founding elephant, who finally succeeded in persuading Dulary to come down the ramp. Dulary followed Tarra directly out into the habitat and the two became instant friends ---vocalizing and touching trunks as if they had known each other for years! 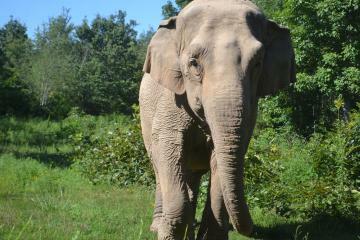 Dulary steadily acclimated to her new environment, new elephants and new Caregivers. 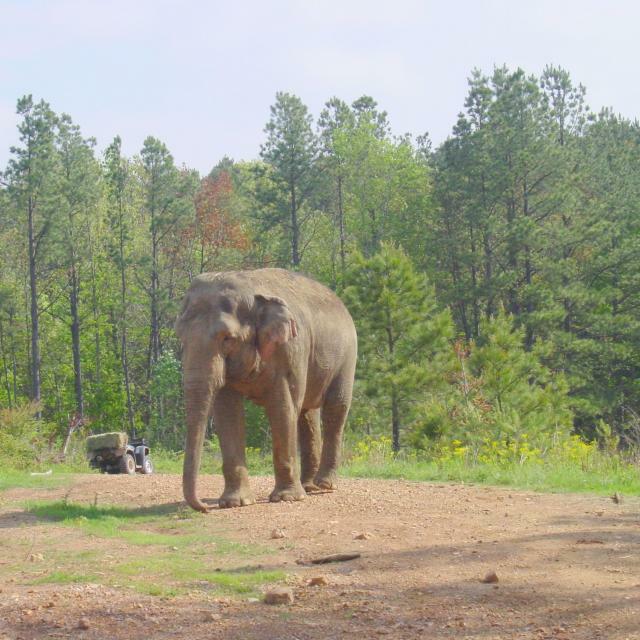 She was independent but spent time with the other elephants, especially Misty and Tarra. She appeared strong-willed & self-confident. Dulary came to The Sanctuary with the reputation of being a "swimmer," and she was often seen in the pond built for her near the Asia Barn. Caregivers noted that she was also very vocal. In early 2013, Dulary began exhibiting signs of intermittent health issues. 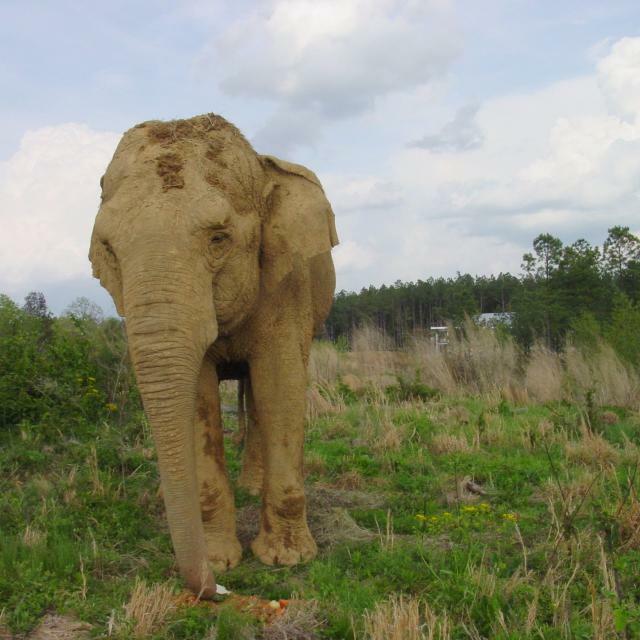 The Sanctuary’s Care and Veterinary Staff administered a treatment plan that included multiple medications and even an elephant “corset” crafted especially for Dulary out of burlap coffee bags. Her health seemed to improve, and she turned 50 in May, 2013. Although Dulary continued to experience chronic health issues, she was active and had a healthy appetite throughout summer and fall. Dulary was discovered lying down in the barn early Sunday morning, December 22nd. There had been no indication of any problems during the night checks. Efforts to help Dulary stand were unsuccessful, and she was given supportive care while further diagnostic testing was performed. Philadelphia Zoo veterinary staff was consulted on Dulary’s condition, and The Sanctuary staff provided round the clock monitoring throughout the night. Dulary passed away peacefully on Monday morning, surrounded by those who loved her. Sanctuary staff then left the area and Dulary’s herd-mates, including her closest companion Misty, were allowed in to be with her. She will be remembered with joy by all of those whose lives she touched.